Facilities operate more efficiently when safety and health considerations are in place. Lost productivity costs businesses over $60 billion* a year! On average businesses spend $170 billion annually on costs associated with illness and occupational injuries. However, facilities focused on health and safety enjoy fewer liability claims among other related cost-savings. Clean environments help in minimizing injury and illness and they create healthier lives for the people who are at your facility every day. At Jani-Clean, we believe in partnering with our clients to increase the benefit of our mutual safety efforts. With dedicated teams specializing in safety, insurance management, worker’s compensation, and liability claims, our Risk Management professionals work together with your team to promote the safest possible environment at your facility. These inspections are made to evaluate compliance requirements and identify potential hazards. Every Jani-Clean employee must undergo a two hour orientation process before they set foot on a facility. The orientation has skills videos, blood borne pathogens, universal precautions training, and a quiz that they must pass. Likewise a background check and drug testing are done. All employees receive basic safety training as well as specialized safety training as needed by their assigned duties. Likewise, our team is trained to consider the safety and health of the people around them, such as building occupants and visitors. 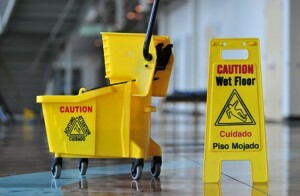 Regulated janitorial processes guarantee quality service for our clients with everything we do. Our training program focuses on teaching the very processes that have made Jani-Clean a leader in the industry. We provide extensive on-the-job training of all chemical, cleaning, equipment, and safety procedures to ensure that our qualified staff outperforms the competition. By aligning environmental issues with important business goals, Jani-Clean can provide a green cleaning program to facilities that want it. Green cleaning is not only good for the environment, it is good for your business and healthier for your occupants. We teach our janitors our standardized process, which includes proper chemical dilution, which translates to a cleaner and healthier environment for visitors and facility tenants. Jani-Clean can easily implement and adopt any safety procedures currently in place at your facility.